October 15, 2016—I have some good news to share this month with all of you. 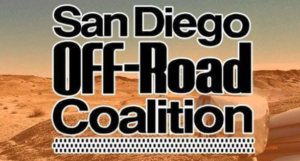 First, SDORC has hired a lobbyist to help with the reauthorization of the OHV program. Kathy Lynch will be guiding us at each step in the legislative process. She has many years of experience lobbying and is familiar with our challenge. People in the capitol are already holding meetings and it will put us ahead to have an advocate involved. Once again I thank Polaris for their generous grant to make this possible. You all know about the Flat-tailed Horned Lizard (FTHL). The Center for Biological Diversity (CBD) petitioned to have it listed under the California Endangered Species Act. If you are the type to participate in organized events in Ocotillo Wells, you will have noticed there have not been any for two years. While the State is considering whether to list, Ocotillo Wells is requiring an incidental take permit obtained from the State Department of Fish and Wildlife. These permits are so expensive no one has obtained one for the FTHL. I heard SDG&E paid around $50,000 for one to drive on existing dirt roads to service power line poles. The way it goes is the Fish and Wildlife agency studies the species for a year then makes a recommendation to the Fish and Game Commission. Just today the Fish and Wildlife agency released their report and they are recommending NOT listing the FTHL! This is really great news for us, but it’s not over until it’s over. The Commission votes on the listing this December at a meeting in San Diego. There have been times when the Commission has voted against the agency’s recommendation, so hold on until the meeting. Thanks to John Ellis, our off-road voter guide is up on our website. Click here to see who supports off-road recreation and give them your vote. SDORC is hosting our 12th annual Lost Lizard Fun Run on November 5. I’ve driven the course and it’s going to be a fun one. I hope all of you can come out and join us. It is SDORC’s main fundraiser and we are expecting to have a great event. Audrey and her team have been doing an awesome job getting ready. We have lots of off-road friendly prizes for our raffle including two sets of four off-road tires! Pre-entry will close Oct 24th, but you can enter at the event. It starts anytime between 8 and 11 am, so you can make it a day trip or stay out all weekend. Remember, SDORC is a membership organization. You can join with PayPal; click here for more info. Help us keep our favorite sport alive by joining and/or donating to us. We have meetings the first Tuesday of the month at Ranch House Restaurant right off Highway 67 at Woodside Dr. at 7:00pm.